In spite of the commitment the men and women of the U.S. Armed Forces have made to their country, and the lip service paid to veterans and current service men and women during elections season, the state of veteran affairs in the U.S. still leaves much to be desired. As Semil pointed out in a post this weekend, when it comes to re-entering the workforce and post-military training, veterans don’t always find equal opportunity. According to The Bureau of Labor Statistics, while the unemployment rate among U.S. veterans has dropped to 8.3 percent, it still sits above the national average, and for younger vets, the rate is even higher. Taking up the cause of their fellow service men and women looking for a better way to find employment after life in the armed forces, two Iraq War veterans, Yinon Weiss and Aaron Kletzing, have launched RallyPoint — an online professional network that aims to empower American veterans to take greater control over their careers — both inside and outside the service. Weiss and Kletzing first met in Iraq some years ago and were more recently reunited at Harvard Business School, where they came up with the idea of creating a “LinkedIn for the Military.” While LinkedIn has transformed online professional networking and recruiting in the private sector, Weiss says, the penetration among the military community is far lower. Military personnel would rather spend their time in a community that caters to their specific needs and connects them with information and resources specific to their experience in the armed forces. Not only that, but while the military outpaces most as a training ground (for building discipline, etc. ), that training generally focuses on life in service — not that which comes after. So, the co-founders have developed RallyPoint into a private online network accessible only by those currently on active duty, which extends to those in the National Guard, Active Reserves, ROTC or Service Academies. In the near future, Weiss says, the team will be opening the network up to former service members, retirees, Department of Defense employees, and so on. But for not, it’s focused purely on those currently serving in the armed forces. 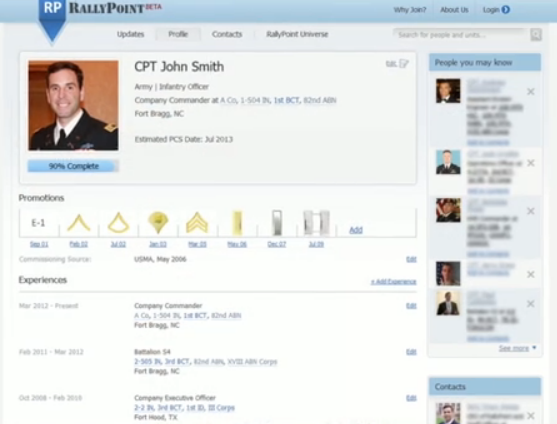 RallyPoint is free for members and has no formal relationship with the military and doesn’t share its data with the military or chain of command, the co-founders said. Instead, the network gives its members the opportunity to establish their professional military identity and offers visibility into the dates at which its members might be shifting into new units and offers some transparency as to the types of positions that would be available to them. 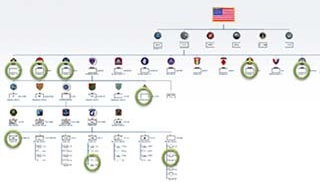 It does all of this in a big military tree-style layout that makes it easy for its members to comb through to see where others fall in the hierarchy, discover friends, connections and leaders from all the major branches of the Armed Forces. The idea, Weiss says, is to make the interface both familiar to active service men and women and easy to use. The less friction, the better. To that point, once approved, members can then search for potential positions by similar rank and specialization and connect with members and decision makers in their future units — with the idea being to improve their chances of getting an assignment that actually matches their skills and preferences. Leaders can then recruit members to join their units based on their profiles and, once members are ready to transition out of the military, they can privately share that date with employers and recruiters, who can then connect with those members in private — long before the date arrives. The idea is to give members a chance to get a head start on planning their post-military careers, without sharing those dates with other members or the military. RallyPoint’s model led it to raise $550K in seed funding earlier this year from a number of angel investors, including Jill Preotle (who is also an investor in TaskRabbit and Zipcar, among others) and more recently saw it take first place in the MassChallenge Startup Competition, which came with a prize of $100K in non-dilutive funding. The startup has also recruited an impressive group of advisors, which includes retired general and former Chief of Staff George W. Casey, former Lieutenant General Ben Freakley, Brigadier General (Ret) Craig Nixon, as well as several other former VCs and entrepreneurs. While RallyPoint has been able to find support at each turn, the challenge going forward — as it is for any startup playing in the networking space — will be gaining the required traction to allow it to achieve scale. Given that an estimated million-plus veterans will be returning to the workforce over the next five years and considering the ongoing struggle among young service men and women to find employment upon leaving the military, the opportunity for RallyPoint is growing. The likelihood is that there isn’t just one key to solving unemployment among veterans, and it’s not surprising to see these solutions not emanating from within the military but from the private sector, often founded by those with years of service under their belts. Rather than a quick fix, allowing service men and women to begin slowly putting the pieces together by networking and ferreting out quality employment opportunities long before they leave the service or change units — feels like it could have some appeal and be a part of the long-term solution. You can also check out TC’s coverage of this weekend’s VetsInTech Hackathon here.